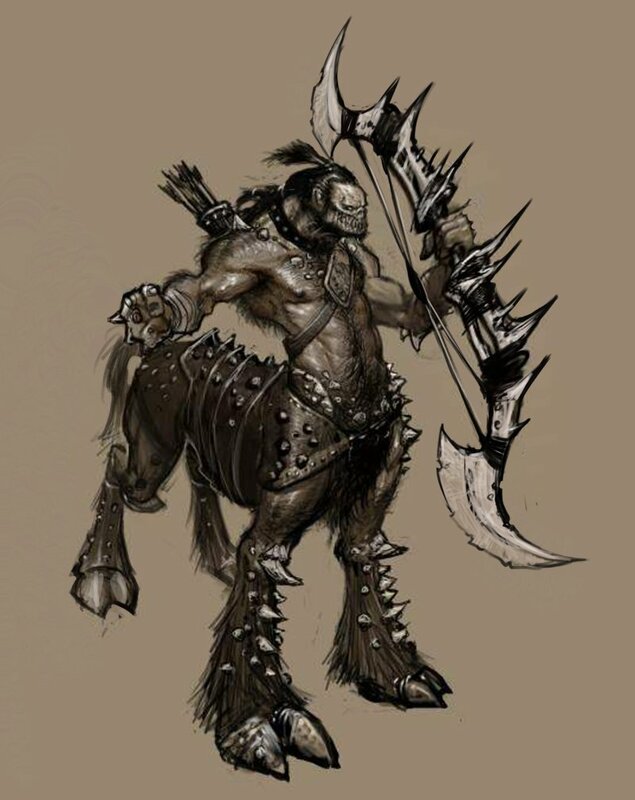 The Centaurs were indirectly created by Zeus. There was a mortal king who fell in love with Hera, The Queen of the Gods and Zeus' wife. He resolved that he would have her, no matter the cost. He invited Zeus and Hera to a dinner, with the plan of stealing her away from her husband. Zeus, however, was not fooled. Instead of taking Hera, he created a woman made of clouds, one that looked exactly like his wife, and took her with him. The king was completely fooled, and his attempts to lure away the false Hera were completely successful. The two were married, and in due course, the had children. Zeus, though, arranged to receive a bit of revenge: the children were born as half-horse monsters. Centaurs had a fondness for good, strong wine, and the got drunk quickly and became violent. On one occasion, a village decided to throw a huge wedding banquet for a newly married couple. Out of courtesy, they invited the local centaurs who drank their fill at the feast and started to cause trouble. They instigated fights, turned over tables, and were generally loud and obnoxious. That's when things got really ugly; they decided to carry away the bride and all the other nearby women. Fortunately, one of the wedding guests was none other than Hercules. He took offense at the Centaurs' attitude, and he wasn't about to let them have their way. He fought off the entire Centaur band that quickly fled from the village. The centaurs in that area were never a problem again.